Now, if you are currently suffering from election fever from the current presidential elections taking place in the USA right now, and need to let off a little steam about it, then Tiny Election Free may just be what you were looking for. This is the 2012 presidential election, Angry Birds style. Yes, you read that right, this is Angry Birds with an electoral twist, as instead of launching birds at pigs, you are launching republicans and democrats at their political enemies in a comical and fun little game. 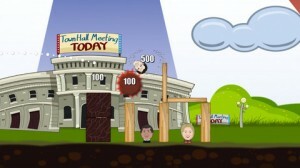 In this comedic cartoon-style political arcade game, award earned votes to your candidate of your choice and follow the worldwide results in real-time. Features informative, real-world voter resource links, including voter registration powered by Rock the Vote, to help make your vote count. 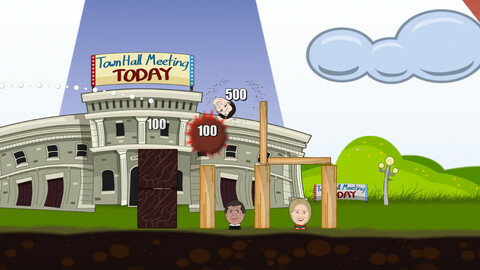 The game features a slingshot function, with the head of your favourite candidate, as well as an optional 16 other heads from the political landscape, being thrown across each stage in an attempt to knock the opposing candidate and his team off of their structures. There are plenty of stages to get your teeth into, as well as some useful voter links. The app is free and ad-supported, but there is a paid version with no ads as well.